Pixel Force: Left 4 Dead is a retro de-make of Valve's hit zombie killing masterpiece. Lovingly recreated in a fashion that would have been acceptable in 1986 for the Nintendo Entertainment System, this de-make stands as the flagship title of the upcoming Pixel Force series from Eric Ruth Games. Go alone, or invite a friend for 2 player co-op against the zombie apocalypse in all 4 of the original game campaigns. 2 difficulties and all 4 of the survivors make a glorious 8-bit appearence, complete with first and second tier weapons scattered along your path to escape. 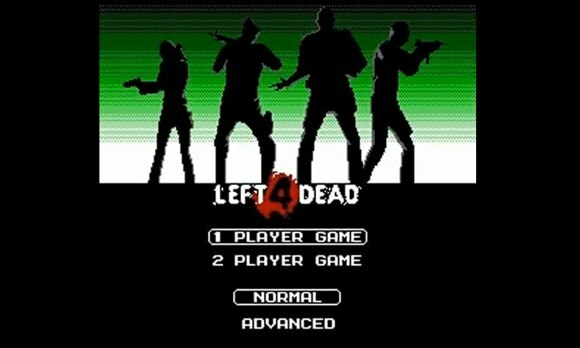 So, grab your controller of choice and kick back with an award-winning retro take on the end of the world with Pixel Force: Left 4 Dead. I cant wait to play this. Tango down.